June Clougher, left, director of the Jump Start Incubator, celebrates the program’s five-year anniversary with some current and previous clients during a reception at Berks County Community Foundation. 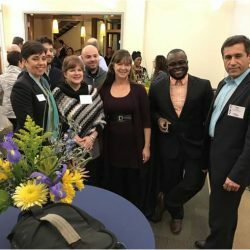 Last week, we celebrated the fifth anniversary of the Jump Start Incubator (JSI), a project of Berks County Community Foundation. JSI is housed in the Community Foundation’s building at Third and Court streets in Reading. It provides supportive startup space and guidance to newly-forming businesses. Over the past 20 years or so, Berks County had a few “false starts” in the incubator business, but under the leadership of June Clougher, JSI has really taken hold. The Community Foundation decided to focus on helping new businesses because the vast majority of our largest employers were founded here in Berks County and grew along with the community. According to the Center on Budget and Policy Priorities, that’s the most effective strategy to pursue to improve a local or state economy. About 86 percent of a region’s new jobs come from startups and businesses that are already located within the state. JSI has assisted 35 companies, including 17 with minority or female ownership. Of those 35 companies, 30 companies are still operating or were sold (a total of two were sold, and that’s a victory, too). Only five of the startups went out of business. That’s a success rate of 85 percent, which is much better than the national average of a 50 percent failure rate for startups. Most of the businesses that are still operating have remained in Berks County. There are currently 12 new businesses in the JSI program. JSI also provides valuable learning opportunities for local college students. Interns from different colleges in the area have been through the program in staff positions. So far, a total of 21 students have gained insights about starting and running a small business through this program. They’ve helped the JSI clients get their businesses up and running and learned valuable lessons in the process. Creating and retaining great jobs is vital for any region’s future. We’re proud of the first five years of the Jump Start Incubator. And we’re particularly grateful to Customers Bank for the generous gift that got it off the ground, and we’re also thankful for the many businesses that have supported it since. Check out this video that celebrates Jump Start’s first five years.